Alejandro Valverde (Movistar) won the final stage of the 2018 Abu Dhabi Tour in Jebel Hafeet on Sunday and captured the overall title. Alejandro Valverde (Movistar) proved to be the best climber at the 2018 Abu Dhabi Tour on Sunday, winning atop the nearly 11-kilometer climb to Jebel Hafeet. The Spaniard not only showed his climbing prowess, but also his sprinting ability, by outmaneuvering Miguel Angel Lopez (Astana) in the final meters to take the stage win. It was a double victory for Valverde on, as he also captured the overall title. Julian Alaphilippe (Quick-Step Floors) won the sprint for third on the stage, proving to have the better finishing kick against Wilco Kelderman (Sunweb) and Rafal Majka (Bora-Hansgrohe). In the final general classification, Valverde was on top with Kelderman in second at 17 seconds. Lopez finished third overall, two seconds ahead of Alaphilippe who was fourth at 31 seconds behind Valverde. Majka rounded out the top five. Former race leader Rohan Dennis (BMC Racing) faltered on the final climb and never truly factored into the mix at the pointy end of the race. He finished over a minute down on Valverde, but managed to finish the race still in the top-10 overall. He was ninth at 1:29 behind. The final stage of the fourth edition of the Abu Dhabi Tour traveled 199 kilometers from Al Ain to Jebel Hafeet. The route was pancake flat until the final 11 kilometers, which were all uphill. A nine-rider breakaway began the final climb to the finish with just over a two-minute gap to the peloton. The breakaway included the likes of Lawson Craddock (EF Education First-Drapac) and Andre Greipel (Lotto Soudal). Respectively, Craddock was the strongest climber in the group and Greipel was the fastest sprinter. Ironically, Greipel would keep pace with Craddock the longest out of all the other members of the breakaway. Once Craddock was brought back into the mix, the attacks came quickly from the general classification contenders. Race leader Dennis was dropped from the front riders with more than six kilometers remaining, while Valverde and Lopez both put in multiple attacks. With less than five kilometers remaining, a select group of seven riders had formed at the front. The riders were Valverde, Lopez, Kelderman, Majka, Alaphilippe, Davide Formolo (Bora-Hansgrohe), and Niklas Eg (Trek-Segafredo). The group weaved all over the road watching each other and attacking each other. Lopez put in a dig with just over four kilometers to go and immediately opened a significant advantage. Valverde then bridged to him with apparent ease. He was clearly on a good day. 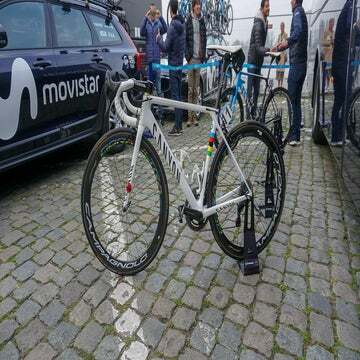 Alaphilippe tried to follow Valverde, but was unable to do so. However, the group had shattered and Alaphilippe was joined by Majka and Keldermann in chasing the leading duo. Behind the leaders, Dennis was suffering and Tom Dumoulin (Sunweb) was throwing his bike on the ground. The Dutchman suffered a mechanical the day before during the time trial, losing any shot at victory, and he suffered another mechanical on Sunday in the final kilometers of the climb. While Dumoulin was calm when the mechanical occurred during the time trial, Sunday was a different story. The Dutchman yelled and threw his bike to the ground in frustration. In the sprint to the finish line, Lopez was unable to outfox the veteran Valverde, as Majka and Kelderman were no match for Alaphilippe. Valverde took the stage win and the overall victory, remarkable results considering the horrific knee injury he suffered on the first stage of the Tour de France last year. At the time, many had thought the injury was career ending. Former race leader Dennis finished the stage 1:43 behind Valverde. While the Australian wasn’t in the mix for the overall title on Sunday, he still leaves Abu Dhabi with a stage win and a top-10 overall finish.